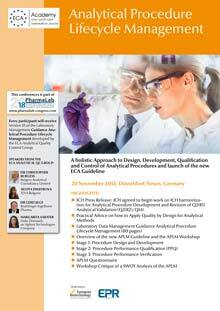 A holistic Approach to Design, Development, Qualification and Control of Analytical Procedures and launch of the new ECA Guideline. The assurance of ‘fitness for purpose’ of analytical procedures is a critical part of any process for ensuring drug quality. Since 2011, USP’s Validation and Verification Expert Panel has been considering how the modern concept of lifecycle model process validation can be applied to analytical procedures. Thus the panel has published articles and a proposal for a new General Chapter in 2017. This is under revision based upon comments received, and it is expected that a new version will be issued in 2018. In addition, the long anticipated revision of the ICH Q2(R1) “Guideline on Validation of Analytical Procedures: Text and Methodology” has been sanctioned and the work plan is scheduled to commence in Q3 2018. It is also proposed to develop a new quality guideline on Analytical Procedure Development. It is intended that the new guidelines will be consistent with ICH Q8(R2), Q9, Q10, Q11 and Q12. In the light of these developments ECA’s Analytical QC Group has developed a new Guideline on Analytical Procedure Lifecycle Management. It is consistent with the ICH and USP principles and provides detailed assistance in their practical implementation. This Guideline will be formally launched at this pre-conference workshop. And as a participant you will exclusively receive a copy. The ECA AQCG has also conducted a survey to find out more about the current status and issues regarding implementation of APLM in industry. The results and conclusions will be shared at this workshop. Are we trying to control means or individuals? Member of the ECA QC Group Board and QP. Overall responsibility for quality oversight of European TEVA suppliers as well as QC and QP Release. Quality Control. Member of the EDQM expert group 11 and Board Member of the ECA QC Group. Manager Compliance Support at Dako. Board Member of the ECA QC Group. Click on the picture to download the programme as a PDF file.